See the best players in the world compete for two days at Center Court. Discuss the history of Wimbledon with Richard Evans, broadcaster, journalist, author and esteemed tennis historian. Hear insights from ESPN commentator Chris Bowers. Learn the history of Real Tennis from a professional at historic Hatfield House, and try the game for yourself. Strawberries and cream. Borg and McEnroe. Venus and Serena. Federer and Nadal. In all of sports there is nothing like the tradition, history and athletic perfection of the Wimbledon Championships. Join us for two days of the tournament with coveted seats at the All England Club’s Centre Court. Outside of the tournament, we have an exciting schedule planned, offering a complete immersion into the wonderful experience of tennis in its birthplace. Lunch: Lunch on arrival day is not included. Afternoon: At leisure before a welcome meeting and programme overview in the hotel at 5:30 p.m.
Evening: At leisure. Your group leader will lead an orientation of the area. Morning: Field trip to Hatfield House, to explore the childhood home of Elizabeth I. In the morning, we will explore the world of "Real or Royal Tennis." Real tennis – one of several games sometimes called "the sport of kings" – is the original indoor racquet sport from which the modern game of lawn tennis (usually simply called tennis), is descended. It is also known as court tennis in the United States, formerly royal tennis in England and Australia (now real tennis), and courte-paume in France (a reference to the older, racquetless game of jeu de paume, the ancestor of modern handball and racquet games; many French real tennis courts are at jeu de paume clubs). The term real was first used by journalists in the middle of the 20th century to distinguish the ancient game from modern lawn tennis (even though that sport is seldom contested on lawns these days outside the few social-club-managed estates such as Wimbledon). Real tennis players often call the game "tennis" while continuing to refer to its more widely played offshoot as "lawn tennis." Real tennis is still played by enthusiasts or realists. Afternoon: The field trip continues. Discover the treasures of this historic royal home with an expertly guided visit. Morning: In the hotel. Lectures by Richard Evans. Richard is a tennis commentator, broadcaster, journalist and author of books on the history of tennis, the lawn tennis association. Teas, coffees and pastries. Lunch: Buffet lunch at the hotel. Evening: After dinner talk by Chris Bowers-The Professional Game. Chris will be commentating from Monday for ESPN and has just returned from the French Open at Roland Garros and the Women's tennis tournament at Eastbourne. Morning: The View from the Chair by a Lawn Tennis Association professional tennis umpire at the National Tennis Centre, Roehampton (subject to availability). Afternoon: Free afternoon to maybe watch the Opening Rounds on TV as Andy Murray defends his title. Breakfast: Full English breakfast in the hotlel. Morning: A full day at Centre Court, The Wimbledon Championships. Travel by underground to Southfields station (London travel card, underground map and useful information will be included in your welcome packet). 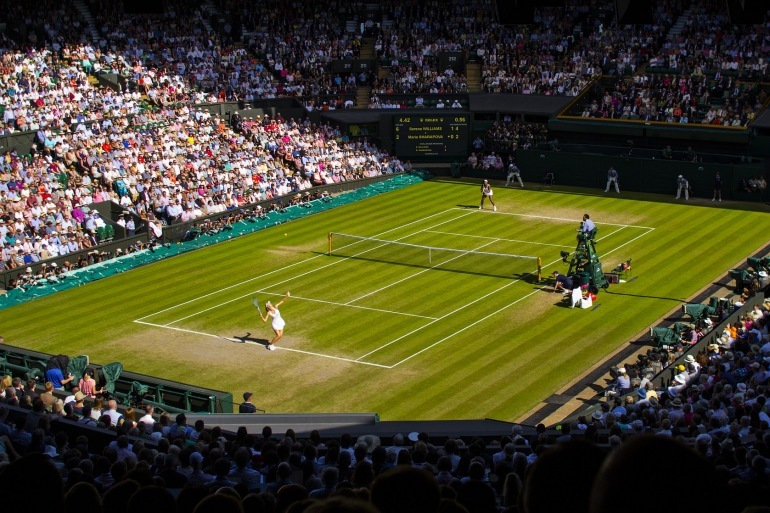 Take a shuttle bus to The Wimbledon Experience, where you wil receive your reserved-seating tickets, Wimbledon souvenir map, official programme, complimentary tea, coffee and Danishes. You then have admission to the Wimbledon Lawn Tennis Museum. For a sporting venue known for its strict adherence to tradition, the Wimbledon Lawn Tennis Museum is impressively futuristic, with its 3D cinema explaining the science of the game and a holographic John McEnroe (yes, seriously) roaming the dressing room. Interviews with players are broadcast on TV screens and an interactive area allows visitors to handle racquets, test their reaction skills in simulation games and have their picture taken with the singles trophies. Tracing the history of lawn tennis, there is memorabilia dating as far back as 1555, while new additions to the collection include outfits worn in the 2011 Championships by winners Novak Djokovic and Petra Kvitova and an exhibition dedicated to Fred Perry. At the centre of the show are the famous Championship trophies, as held aloft by the game's greatest players. There is also a display dedicated to a proud Wimbledon tradition, the queue. Evening: Tennis continues perhaps under the roof. Morning: The tennis continues at Wimbledon outer courts. Afternoon: Tennis on Centre Court. Morning: Free day to enjoy London's many museums, galleries and parks. A modern hotel in fashionable Kensington, next to Gloucester Road underground station. Chris Bowers has been reporting on the international tennis scene since 1986, the year Boris Becker and Martina Navratilova won singles titles. He has commentated on Wimbledon for the BBC since 1994. Fluent in French and German, Chris is the author of several books, including “The Book of Tennis” and “Roger Federer: The Greatest,” which chronicles the career of the 16-time Grand Slam and seven-time Wimbledon champion.